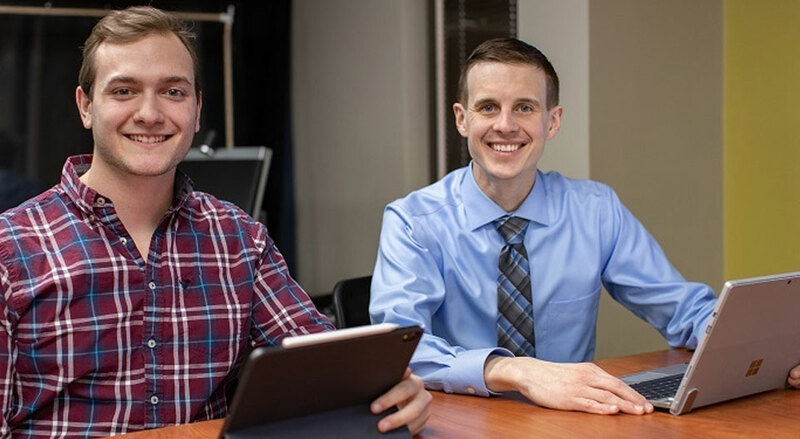 Tyler Hillery and Professor Nik Butz are working on research to improve the hiring process for area businesses. As a junior majoring in both business administration and finance at the University of Wisconsin-Stevens Point, Tyler Hillery has set long-term goals for himself, such as earning a graduate degree and having a career as a business analyst. Hillery is learning the same “grit” that keeps him working toward his goals may also be key to helping Central Wisconsin employers create a hiring process that minimizes employee turnover and saves training dollars. The Wausau native has been working on an undergraduate research project with of Assistant Professor Nikolaus Butz in the School of Business and Economics since fall 2018. Their work focuses on the “Grit Scale,” a list of 12 personality traits, such as courage, endurance and conscientiousness, that sets people apart for success. While it was developed by author Angela Duckworth to study student achievement, Butz found it applied well to the business world. “The Grit Scale represents people with both passion and perseverance over time,” said Butz. “These are the same attributes that make for a great workforce.” Butz has been researching the topic since he was in graduate school and has found that people who score high on the Grit Scale are more likely to be entrepreneurs. “It is more about having that X-factor personality than what is on a resume,” he said. Their most recent study surveyed more than 100 employers in Marathon, Portage and Wood counties to find what they looked for most when hiring, Hillery said. Rural employers are finding it more difficult to fill vacancies, so they need workers who will stay long-term. Hillery said he is not only gaining valuable insight he can use as a business analyst, he’s gained skills in data collection, interpretation, written and oral communication for business and the publishing process. The work will continue with further research and follow-up with surveyed companies. Hillery will present information on “Grit in the Rural Economy: Unlocking the relationship between employee selection and success” as part of the 16th annual “Research on the Rotunda” April 17 at the Capitol Building in Madison. He will be among undergraduate students from across the UW System to share their projects with legislators, state leaders, UW alumni and others. He also presented at the Minnesota State Undergraduate Scholars Conference at St. Cloud University March 25. In addition, he co-authored a paper titled “Inside the hiring process: How managers assess employability based on grit, the Big Five and other factors” that will be published in the International Journal of Business Environment. Butz and School of Business and Economics colleagues, Assistant Professor Reed Stratton and Director of Advising Max Trzebiatowski are also authors. Hillery currently interns as an analyst at Wausau Homes, where he will work full time after he graduates in December, in only 3 ½ years, thanks to advanced placement and internship credits. He also credits a smooth transfer between UW-Stevens Point at Wausau and the main Stevens Point campus, as well as Trzebiatowski and Professor Kevin Bahr, his advisers at UW-Stevens Point. He said he looks forward to being able to apply the skills and knowledge from his classes, internships and research to his career. Employers who want to learn more about hiring for grit may contact Butz at nbutz@uwsp.edu or see https://angeladuckworth.com/grit-scale/. This research, as well as other undergraduate research projects in the School of Business and Economics, was made possible partially through the Klismith SBE Community Engagement Endowment.